A list of their accomplishments reads like the curriculum of a masterclass in storytelling. “Blood Simple.” “Raising Arizona.” “Barton Fink.” “Fargo.” “The Big Lebowski.” “Oh Brother, Where Art Thou?” “No Country for Old Men.” “Inside Llewyn Davis.” “A Serious Man.” These are films about people living within an ideal, untethered to the traditions of ordinary exposition, where they can live on the screen rather than simply exist there. But they are also, beneath their almost gleeful charm and insatiable wit, prototypes of a behavioral system that resists ordinary method. Maybe it is of little wonder that so many of their movies deal with outlaws, vagabonds or saintly voices of reason; they are the extremes within plot devices that drive us towards a labyrinth of stimulating uncertainty. Among contemporaries obsessed with the nuance of great moral puzzles, no other directors in the modern era remain as potent, or as relevant, after so long. 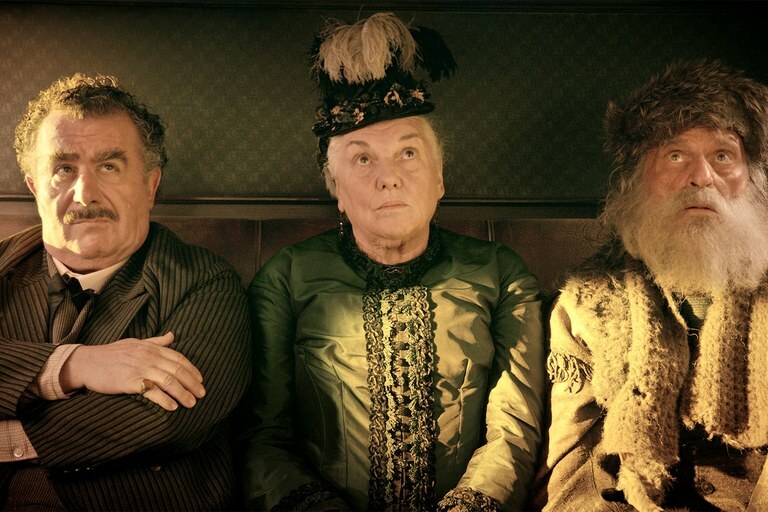 Much of this is obvious throughout “Buster Scruggs,” which begins like a raw exercise in irony before sinking strategically into the gradual clutches of a provocateur’s madness. Here is a film where everyone seems to be operating in realities with few ground rules, where gunshots rarely promise immediate death and words cut through actions like weapons punching holes through time. The Coens come to them as if marveled by the intrigue they inspire, all while creating a broad illustration that emphasizes the zeal of their identity. Consider how freely exaggerated the Buster Scruggs character is, for example. He is played by Tim Blake Nelson, in a performance of brief brilliance, as a man who is destined to draw the hand of death but exudes a cheerful detachment from that certainty. It is little wonder that the film is named after him – only on the screen for a mere 10 minutes, he embodies the audacity of self-awareness in a world that seems weighed down by a literal and foreboding cognizance. There is a moment in a parlor, just before an ill-fated poker game, where we have no idea where any of this is going – whether Scruggs’ bloody encounter with fellow outlaws is meant to formulate an overreaching theme, or if his presence simply reflects the need of his creators to exploit the wonder of the audience. Could he be functioning on some deeper level as an avatar, even? A symbol of how they conduct themselves as skillful instigators? If we go with that assumption, then a more perceptive contrast lies in the second story: also about an outlaw (James Franco), who is thwarted in a robbery by a fast-talking bank teller, sentenced to hang by a band of shrewd western henchmen, saved in the 11th hour by a thieving cow rustler, caught in his company, wrongfully accused of being an accomplice and taken to the same fate he once avoided. Like the Scruggs arc, the experience here is a brief one – more about mechanics and mood manipulation than the misadventures of a single personality. But each is an example of how a skill with edits and movement can alter the course of our response: how we can be roused by comic insights in one instance and then bewilderment in another based on simple shot angle and focal intensity. Many of their absurdist pictures functioned with the same underlying prowess, and when one considers the two yarns it’s not too much of a stretch to be reminded of their “Burn After Reading,” a movie that went enthusiastically off the rails. More patient and centralized viewers will come to the later elements of the picture with more affection. “Meal Ticket,” the third story, tells of a travelling frontiersman played by Liam Neeson who profits shamelessly off the skills of his cargo: an armless and legless sideshow (played by Harry Melling), who has an impeccable skill as a speaker. The early scenes show him reciting, among other things, literary soliloquys and biblical passages, all while being applauded by townsfolk who have wandered in the vicinity to observe him with cautious affection. The voice is convincing, eloquent, commanding. But his material carries an air of its own foreshadowing; soon the crowds are beginning to dissipate as new sideshows begin springing about, leaving the Neeson character in a quandary: when you can no longer reap the monetary benefits of a skilled “freak,” what do you do with him? The closing scenes of this segment suggest the same sort of cruelty that runs rampant in their later pictures – particularly “No Country for Old Men,” where the values of ordinary men are mercilessly drowned out by a force of chaos. Are they simply moving to the beat of their own internal rhythms? Ones that seem directly inspired by the writings of Flannery O’Connor, who also took delight in setting her stories in the seedy underbellies of her characters? Or are they, just maybe, making a statement about the trajectory of an artist’s values over time? Most directors begin their careers making accessible films before splitting off into more obscure paths – some cynical, others subterranean. Then there are those like Bergman and Malick, whose later works reflect a desire to move beyond linear narrative and rest confidently in the clutches of literal psychology. Each passing movement of “Buster Scruggs” seems to demonstrate this arc right down to the base instinct, even as the narratives appear to be operating with straightforward motives. The segment that might inspire the most discussion is “The Gal who Got Rattled,” in which a woman is left to fend for herself on a trail of strangers after her brother dies of an illness. What occurs to her across the journey is hardly out of sync with yarns about the Old West – even right down to the obligatory marriage proposal from a wayward peer who dreams of finally settling down – but the climax of the sequence casts a greater doubt. Was her experience an experience at all, or was she simply a Macguffin to trigger a broader scope of intention? The oddest segment is the final one, about five people with no connection to one another sharing space in a carriage that is taking them… who knows where? The destination isn’t necessarily relevant until verbal discomfort has shed light on the identities of two men, who are bounty hunters carrying the corpse of a recent acquisition with them. But their bemused conversational skills point to something greater that is underscored, quite obviously, by a shot of one man peering out the window to ask the coachmen to stop the horses. Notice how the figure at the driver’s seat is obscured in shadows. Or how the scene begins with light sneaking inside the carriage windows before it gradually dies off, leaving the passengers without a clear distinction of their destination. Lesser minds might not immediately notice the obvious visual cues. Perhaps even the earlier Coens fans would be thrown off by the nuance. But at this moment, just as their careers seem destined to move towards more transcendent themes, the sequence plays like a prophetic warning. It is a celebration of the same ancestral wisdom that may herald what is to come in their unending well of inspiration. That “The Ballad of Buster Scruggs” is primarily being marketed on Netflix is indicative of the changing standards for modern film distribution, which has already been suggested by the recent arrival of “The Other Side of the Wind,” the long-lost Orson Welles film, and the upcoming “Roma,” the newest vehicle from Alfonso Cuaron. What these three pictures suggest, furthermore, is how serious streaming services are at having a genuine slice of the Hollywood pie in a time when the machine is afraid to try out new ideas or embrace the voices in the margins. These are not movies diminished by a false assumption, but serious endeavors attempting to change the stigma of the system. They are also well-made, to boot – a fact that is greatly emphasized by the mere look of this picture, so filled with astounding production values. There is a moment during the middle when an old man, travelling almost wordlessly through a valley while on the hunt for gold, stops to drink in the details of the natural order surrounding him. This is one of the most startling settings seen in any recent film, a fact that is amplified by just how patient the camera is with the details. Think back to what Netflix was when its streaming channel first debuted: would anyone have suspected such precious discoveries being made on their platform, much less debuting there?